Suzanna Ohlsen makes a no-look pass during a game against Western Oregon on February 21, 2015. The situation played out hundreds of times in four years: Suzanna Ohlsen ’15 would dribble the basketball up the floor, and survey the situation. One of her Seattle Pacific teammates was about to be on the receiving end of a pinpoint pass — and she was about to pick up another assist. Maybe it was a laser-beam two-hander to Maddey Pflaumer or Hannah Rodrigues under the basket. Perhaps a nifty no-look to Betsy Kingma deep in the corner. Or a behind-the-back beauty to Aubree Callen. This assist was in the classroom, to her boyfriend ... and a fictional character named Chilly Willy, the not-so-fire-breathing dragon. Ohlsen, a 4.0 student whose biochemistry major was far removed from children’s literature, found herself helping with writing and drawing, and getting drawn into a story. So was watching her perform during her four years as a Falcon. 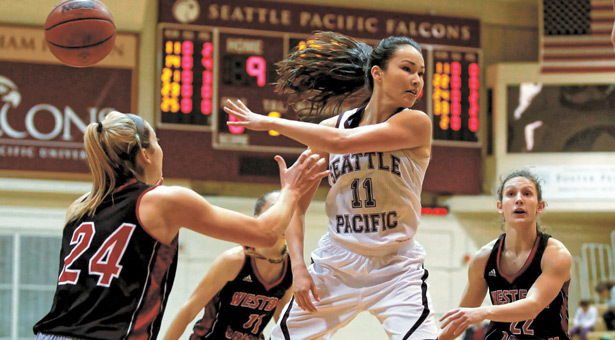 This past season, Seattle Pacific made the NCAA Tournament for the first time since 2011. But while Ohlsen was the one running the show — averaging 17.7 points, 3.9 assists, and 2.3 steals per game for the 22–7 Falcons — she was adamant that without fellow seniors Callen, Kingma, and Pflaumer, it wouldn’t have been nearly as successful of a show. With her academic and basketball skills, Ohlsen could have gone anywhere. She was recruited by Princeton and Harvard, and had taken official NCAA visits to Long Beach State, Seattle University, and Idaho. 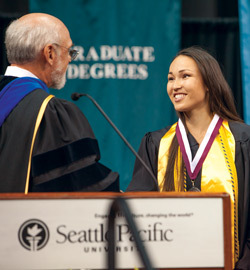 She was recognized at Undergraduate Commencement with the President's Citation, given to one graduating senior who exemplifies the mission and vision of the University. On her visit to SPU, Ohlsen wasn’t expecting anything special. So she came, playing hard and studying harder. “There’s a reason why she’s the smartest athlete in the nation,” Pflaumer says in reference to Ohlsen’s recent CoSIDA Academic All-America Player of the Year award for Division II. “From lapping me in the two-mile run to her leading the pack in Sergeant Mike’s conditioning, she never accepts anything less than her best. But what about that rare day when there was no basketball and no school? How would she spend it? Or perhaps, having just turned 22, she might merely sit and ponder the future. “I don’t know if there’s ever a time when I’m completely done with basketball,” says Ohlsen, already accepted into the University of Washington’s pharmacy school, but also pondering a chance to play hoops in Korea, her mother’s home country. No matter what, that future is looming. It’s one that will include more studies, some more assists — and maybe even another tale or two about Chilly Willy.